SMath Studio is a math program with "paper"-like interface. It has an ability to work with systems, matrices, vectors, complex numbers, infinities and fractions. - Addition, subtraction, multiplication (scalar and vector), division, finding of factorial, raising to power, roots, determination of modules, trigonometric functions, inverse trigonometric functions, hyperbolic and inverse hyperbolic functions, logarithms, determination of signature, calculation of an argument, determinants of matrices, transposition of matrices and vectors, minors of matrices, algebraic additions to matrices, calculations of matrix trace, ranking, conversion of complex numbers from algebraic to trigonometric form. 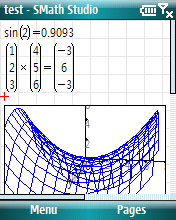 - Display of 2D and 3D graphs of functions for variable "x". - Symbolic and numeric differentiation (derivatives) are available. - Support of parameters (constants and user-defined parameters). - Automatic saving of user's preferences while exiting the program.